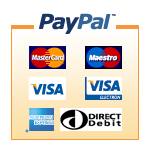 For payment we can accept either Cheque, Bank Transfer (our preferred method) and now to give our customers even more flexibility we can now accept online payments using either Google or Paypal. All transactions take place in secure encrypted areas so your payment details will always be safe. You’ll need your invoice number and amount you want to pay, then click on one of the providers below and enter the requested details. Thank you for using Ardnet Online Solutions.